TODAY: Minneapolis and Rochester classes canceled and operations suspended. Paid Fellowship for Trip to Holocaust Museum in Washington, D.C.
Augsburg University has canceled classes and suspended normal operations Tuesday and Wednesday at both the Minneapolis and Rochester locations because of severe cold. Students are encouraged to consult their course Moodle site and monitor email for any additional information and alternative coursework from their instructors. Posted on January 30, 2019 Email a correction for this post: TODAY: Minneapolis and Rochester classes canceled and operations suspended. Decisions to cancel classes are made by 6 a.m. for daytime classes and 2 p.m. for evening classes. 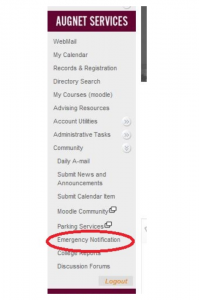 The University uses the Augsburg Emergency Alerts system to communicate timely information on campus emergencies and class and facility changes due to severe weather. The Augsburg Emergency Alert sends subscribers a text, email, and phone call (subscribers determine which and how many alert types they wish). Only people signed up to these alerts receive them. After the alert is sent out, information and updates about weather-related class cancellations and closures are posted on the “News” section of the Department of Public Safety website. This information is then shared with television and radio stations, and lastly on Augsburg’s Facebook and Twitter accounts. The 2019 trip will take place on April 16th. Applications are due on February 28th and can be found at http://jewishminneapolis.org/minne/. If you would like to learn more about the program or would like advising on the application, please contact the URGO office at urgo@augsburg.edu or 612-330-1446. Posted on January 30, 2019 Email a correction for this post: Paid Fellowship for Trip to Holocaust Museum in Washington, D.C.
URGO PHASE 1 APPLICATION DEADLINE IS EXTENDED TO TUESDAY, FEBRUARY 5th at 11:59pm. PHASE 2 APPLICATION DEADLINE REMAINS FEBRUARY 19th. Are you looking for a paid summer research opportunity here on campus? URGO applications for 2019 summer research are now available on the URGO website at http://www.augsburg.edu/urgo/research/on-campus-research/ All fields of study welcome! The URGO Summer Research Program is an 11-week, on-campus program where students are funded to conduct research with a faculty mentor. Students receive support throughout the research process from their faculty mentor, a Speaker Series, and weekly seminars with fellow researchers. URGO provides full-time summer researchers (400 hours) with a $4,000 stipend and housing discount while half-time researchers (200 hours) receive a $2,000 stipend. The program runs from May 16th – July 31st. Phase 1 of the applications are due February 5th, so start talking with your faculty members to learn about what research is going on in your department! Are you a sophomore or a junior with a deep interest in central issues and theories regarding conflict, war and peace. Then this program is for you! Six colleges founded by Norwegian-American immigrants in the 19th century sponsor an annual summer Peace Scholars program in Norway, designed to deepen students’ understanding of central issues on the global arena. If selected as a Peace Scholar you will be awarded a seven-week academic experience held at The Nansen Dialogue Network in Lillehammer and The University of Oslo International Summer School. More information, and application instructions, can be found on our Center for Global Education and Experience (CGEE) website. GHOST SONATA: A collaborate movement piece! Those invited to participate will have the opportunity to work with Sod House Theater Company and Black Label Movement. PLUMA & THE TEMPEST: A dystopian play in the Latin American tradition of magical realism that poetically explores themes of violence, trauma, homelessness and resisting oppression. Professor Mark Tranvik will facilitate a four-session group seminar/book study on vocation. Using Parker Palmer’s book, Let Your Life Speak: Listening for the Voice of Vocation, seminar participants will explore how they can use their gifts and talents in service to others, learn about the history of vocation at Augsburg, and hear from others who will share their vocational journeys. Our co-sponsors, The Christensen Center for Vocation, The Center for Teaching and Learning and Human Resources are delighted to be able to cover the cost of lunch and the book for this series. This series will take place on February 6, 13, 20 and 27, 2019 from 11:30 a.m. to 1:00 p.m. in the East Commons, Christensen Center. Space is limited – register soon! We are sorry to announce the cancellation of the film screening “In Order of Disappearance” tonight due to the weather conditions. Look for updates soon as we hope to reschedule in the near future. You may know that in Norway we consistently argue there’s never bad weather, just bad clothing — however I believe the -50 Fahrenheit would toss that argument out! Your safety is of course way more important. Contact Bettine at hermansb@augsburg.edu or x1378. You are warmly invited to attend an on-campus showing of the documentary titled, “The Test & the Art of Thinking.” The film addresses crucial questions about the SAT/ACT college entrance exams, including the value of the test score and what the test actually measures. In 2018, Augsburg voted in favor of piloting a test-optional admission policy. The admissions department is organizing this thought-provoking opportunity as the institution continues to better understand the impact this policy has on applicants to the university. When: Thursday, January 31st, 3:45 p.m. Popcorn and beverages provided. Optional questions, comments, and discussion following the film. The spring 2019 All Hands meeting is Thursday, Feb. 7 at 11:30 a.m. in Hoversten Chapel. All members of the campus community are invited to attend. Access to connect to the meeting from off-site locations will be available. For the livestream link or to add a session to your calendar, go to the All Hands page on Inside Augsburg. The Center for Global Education and Exchange is hosting a focus group to help us develop new brochures for our study centers! We want to hear your opinions on study abroad/away brochure design and information. What would be helpful to know? What styles are most eye-catching? Join us Monday, February 4th, 10-11a.m., in the Marshall Room.